Ok let me preface this with the fact that I have seen this film before but saw it again at a friend's house and let me tell you I can describe it in one word...WOW! This film is absolutely amazing. All of the actors turn in Oscar worthy performances in this movie and a lot of attention was paid to writing an intelligent and engaging storyline. The film follows IRS agent Harold Crick as he goes through his mundane day to day routine until one idle Wednesday while counting brush strokes. He begins to hear the voice of a narrator that is speaking accurately about his thoughts and feelings on everything. Throw in the fact that the narrator drops those little words.."little did he know events had been set in motion starting his imminent death." This sends Harold into a frenzy to figure out what is going on by consulting a professor of literature played by Dustin Hoffman. Through Dr. Hibbert's findings he is forced to track down author Karen Eiffel played BRILLIANTLY by British actress Emma Thompson. 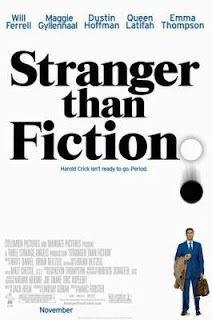 Stranger Than Fiction is one of those rare films that gets you emotionally involved with the story and attached to the characters. As well as raising some thought-provoking questions about the narrator of our lives God. Don't miss this wonderful yarn!